Semester exams were approaching and a few teachers, who were the wiser, were concerned about the broken Scantron machine. I hadn't used a single bubble sheet for the first two terms, but it was approaching my time to participate in the collection of data via Scantron. The campus expectation was to review data from the common semester exams to guide discussion about teaching and learning, which is great! The part that troubled me was the upset over a machine that costs a lot of money to fix and doesn't do anything more what a free (or really low-cost) app could provide. Yet, I said nothing. 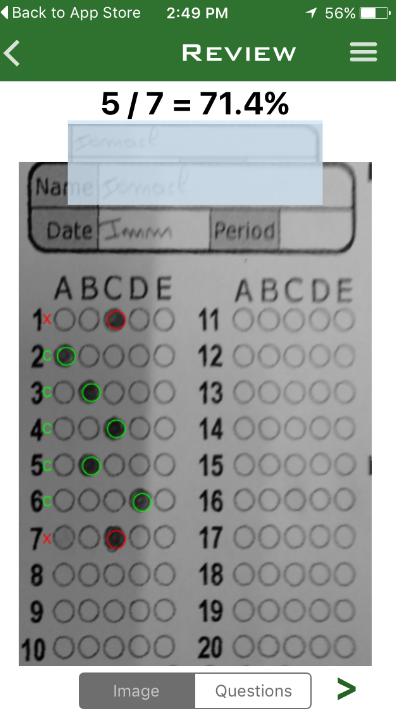 The truth is that, at the time, I hadn't done my homework on apps that could replace Scantron. I had a few questions to toss around, but still needed to test a few to be able to say, "Here's what we can do." ZipGrade was my choice, and I haven't looked back. It continues to provide access to assessment data with convenience. 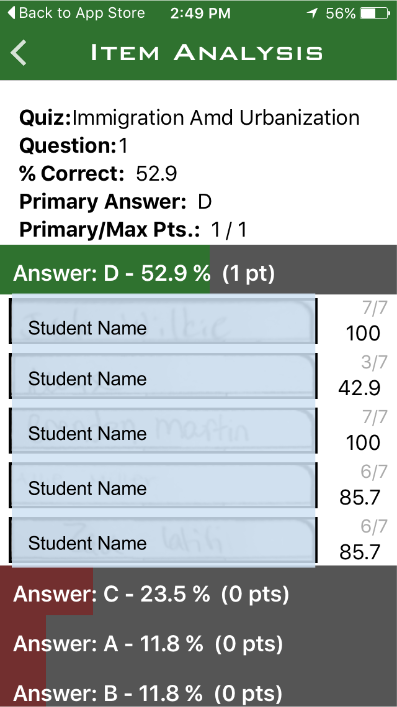 My favorite part about using ZipGrade is that, like Plickers, it allows me to use technology to improve teaching and learning. Bottomline: Paper works and loads fast. One device to collect the data is easy, too. Here are some of the features on the ZipGrade app that I now use regularly. The home screen of the app lists your most recent quizzes and allows you to search and organize them to suit your work routine. This screen also allows you to make a new quiz by touching the "New" text in the upper right. 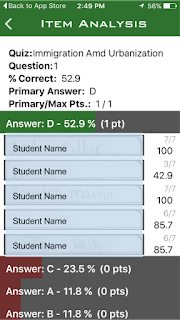 When you touch a quiz, the Quiz Menu opens and provides information and links to edit the key, scan papers, review papers, and the item analysis. Within each of those links, you will find more access to crucial assessment data. Editing the key is a piece of cake. Like all of the functions on ZipGrade, making and changing the key is intuitive. This screen also allows you to make multiple keys for different versions, as well. Be sure the students are indicating the version (A-D) on their answer sheet. 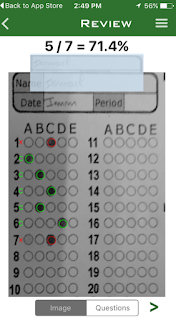 Align the four corner boxes, and the app uses your camera to scan the answer document. I've been using quarter-page sized answer documents (20 items) because they save paper. 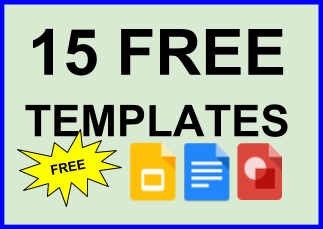 Go to the ZipGrade website to print PDFs or PNGs of 20-, 50-, or 100-item sheets. This is where the magic begins. 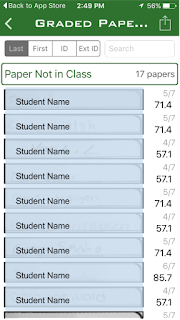 The ability to access all answer sheets from a device that fits in my pocket is a game changer for a teacher who doesn't want to wait to solve problems yet refuses to carry around stacks of papers. And, for the moment our data-addicted schools have been waiting for ... The item analysis screens start with a class breakdown per question and allow you to dig deeper into choice data for each item. 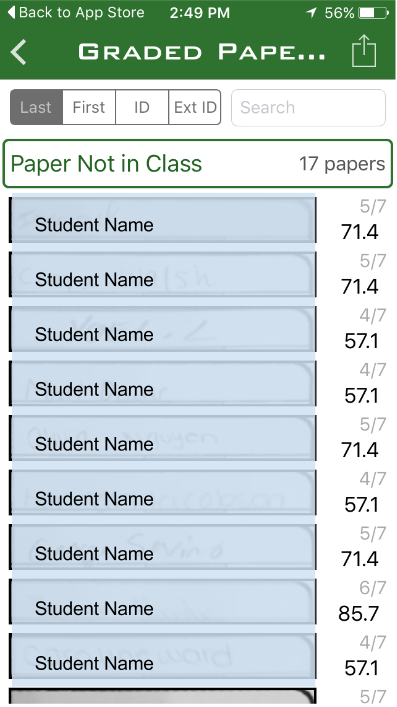 Additionally, touch any choice and a list of students will drop down. As of now, I think ZipGrade has thought of everything.